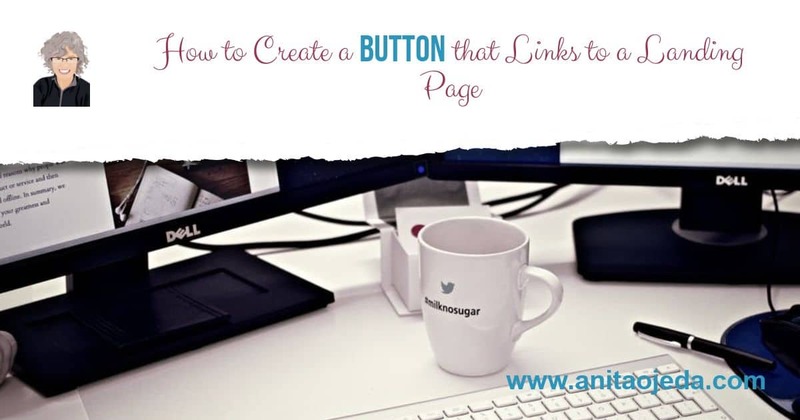 Have you ever wondered how people add cool clickable buttons on the sidebar of their blog that lead to another blog page or post on their site? Here’s the skinny on how to add a button that links to a landing page (or post) on your blog if you have a self-hosted WordPress site. This kind of button comes in handy if you’re participating in a writing challenge like the #Write28Days Blogging Challenge. Write and publish your landing page. Make sure you have a square graphic somewhere on your page with dimensions of 1024 X 1024 pixels. You can create one for free on sites such as PickMonkey or Canva. Go to your blog’s Dashboard and scroll down to the “Appearance” button and click it. Locate the ‘Text’ box, click on it (grab it), and pull it over to the right where your sidebar widget area is located. Let go (drop) the Text Box in the position you’d like it (I put mine right under my search box). Next, click on the ‘Text’ tab. Now copy your landing page (or post) URL. Paste the landing page URL into the area of code where it says YOUR LANDING PAGE URL (make sure it has no extra spaces and falls within the quotation marks). Now open another window with your blog’s dashboard and go to the Media Library of your blog. Click on your button and you’ll see a URL address for the button. Copy it. Paste the button’s URL into the area of code where it says YOUR BUTTON’S URL GOES HERE (make sure it has no extra spaces and falls within the quotation marks). You can change the size of your button by changing the numbers here. Just be careful not to mess with any of the other code! Now click on the ‘Visual’ tab to make sure that your button looks perfect. Make sure you save it! Now, check your website and make sure your button looks beautiful! Thank you for sharing your wisdom. I am going to have to go back and see if I did them right. I know I couldn’t get them centered, but I see you did. You are a jewel. Saving this post. You’re welcome! I know how much NOT being able to do this stuff frustrated me at one time. Now I create posts like this so I can remember how to do things I don’t do very often ;). So, I have this plugin (I paid for it, but it was very reasonable) called ‘tasty pins.’ There’s a link to it in my sidebar (black and pink). It allows me to choose what Pinterest pulls for pins. That way, when I have a whole bunch of not really pinnable graphics (like I do in this post), I can create a nice graphic and require that Pinterest pulls it first.